Fantasmagorie gives you a lot to think about in its less-than-two-minutes of running time. It’s a film you watch and reflect upon; conscious that you’re doing so, even as the film plays. You won’t lose yourself in it, but it will make you wonder, more than a little bit, about the world you live in. Drawn and filmed over a period of about four months by French cartoonist and puppeteer, Émile Cohl, Fantasmagorie follows the adventures, I suppose, of an unnamed clown. But I don’t know if “adventures” is the right word for what we see. Even “experiences” seems wrong, since the action on-screen isn’t specific to a place or period; or even to a physical space; nor does it progress through time in any kind of a normal way. Cohl’s animation resembles chalk drawings on a blackboard, recalling the (slightly) earlier work of Anglo-American cartoonist J. Stuart Blackton, who probably influenced him. 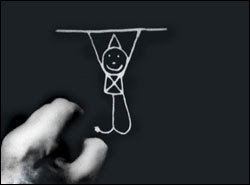 But the film actually begins with a live-action shot of a cartoonist’s hands (probably Cohl’s); it is these hands that draw the smiling clown, who instantly begins to transform, driving the narrative. Not that there’s any real story here. Fantasmagorie is pure spectacle, designed to wow you with the speed, fluidity and variety of the images it presents. The clown collapses, swells and bursts, becoming other beings, or things—or just adopting other forms of itself, depending on your point of view. Other characters enter stage left or right, interacting with what’s already there, but no one thing can be confirmed as physically separate from the things it runs into, at least not for very long; indeed, that running-into usually results in both entities merging to become a single something-else. Fantasmagorie resembles a lot of early animation, in that its character(s) are physically malleable, and capable of conjuring something from nothing—from an unbounded, undefined, unlimited supply of surrounding space. With no story, no distinctive identities, and no visible backgrounds (the clown and his various forms/friends/objects are, in effect, their own background), Fantasmagorie probably represents the extreme limit to which an animated film can ignore physics and remain coherent. Even the rubber-limbed animals in early Disney shorts stick closer to reality than this. 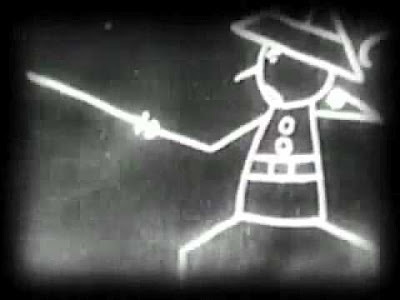 Silent era animation was rarely this good. We prefer to remember Max Fleischer’s “Out of the Inkwell’ series, starring a reality-hopping Koko the Clown; or the early Felix the Cat cartoons—the best of which, like FelixDoubles for Darwin (1924), cause us to ask profound questions. Fantasmagorie does the same. But a lot of silent animation is plodding and stiff, due to limitations of technology or talent. 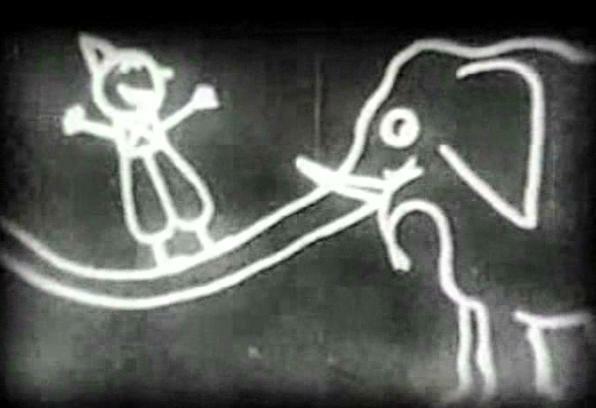 Too many of these early cartoons are simply comic strips committed to film. And they would work better if they stood still. Fantasmagorie is no comic strip. Strips, even metaphysically weird ones like Little Nemo in Slumberland or Krazy Kat, present images fixed in time and space. These images do not progress or evolve—they are reproduced, perhaps with modifications, from panel to panel. This is how we determine that something has occurred. Ignatz was here—now he’s here.Or, Ignatz was here—and he’s still here, now. Everyone knows that if you look at a length of film, you’ll see something similar. But film moves, fast, and tricks the eye, so we think we’re observing movement. We must rely on the continuity of the images on-screen, plus our own memories, to help us follow along. Continuity of image is everything in Fantasmagorie, yet it provides no certainty of anything. Usually, films are grounded firmly enough in a familiar reality that we can distinguish a character from its environment—that which changes from that which stays the same—and plot cause and effect. In Fantasmagorie, we can’t. Characters, objects and environments are not, for certain, different things at all. We can see that A became B, but can’t explain why or how. What came before—what we remember—does not impact what we see now. What is the ‘stuff’ that Cohl’s characters and objects are made of, anyway? It’s a kind of matter, I suppose, but all the same kind: it’s the Line. The Line is all things. 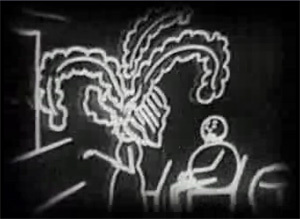 Early in the film, we see a man in a movie theatre, his view obscured by a woman in front of him, who wears an enormous feathered hat. It’s an old joke. The man can’t see, nor does he wish to litter, so he tears a hole in the black nothingness behind him, and deposits into it the feathers he plucks from the hat. The man, the woman, the hat and its feathers—and the hole—are all made of the Line. And, when Cohl is ready to move on, all five things will distort themselves into something else, also composed of the Line. This is the whole world. It is the only continuous thing; the only constant. The only constant in our world, I guess, is physical laws. Matter cannot be created or destroyed (just as the Line cannot be), but physics determines how and when and into what new form that matter will be reassembled. It sets limits. The Line is not constrained by such physical principles. It can be anything. And watching it makes us think of many things; so many that we feel ourselves possessed of an almost infinite imaginative potential. That, I believe, is how early animators felt about their art. Somewhere, in all of this, and maybe in all of what came before, I’m urging you to watch this cartoon. Fantasmagorie is streaming free on MUBI’s website right now. But if you miss your chance to see it, there’s always YouTube. Interesting, though. I like the part where Cohl pastes him back together.